This will make more sense when you see our video. 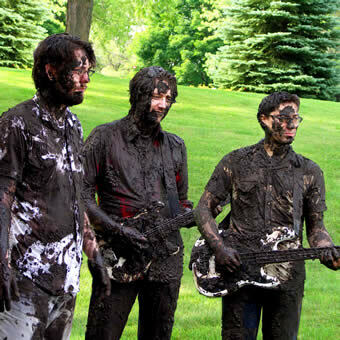 The Buddyrevelles were formed in 1997 in Eau Claire, Wisconsin by Aaron Grant (guitar & vocals), Scott Hoch (bass & vocals), and Dan Reinholdt (drums). In 1998, the band recorded and released their first album, September, November on Motorcoat Records and subsequently relocated to Chicago. The album’s melodic layered guitars, vulnerable vocals, taut over-driven bass, and propulsive drumming introduced the band’s distinct but accessible pop sound to the public. Their second album, American Matador was released in 2000. Through it, the band showed a willingness to experiment with increasingly complex song structures and inspired instrumental breaks while managing to keep their sound firmly rooted in the indie-rock idiom. Now, nearly ten years since their formation, the Buddyrevelles have returned with a new offering. Don’t Quit, the band’s first release on Chicago’s Solitaire Records, finds them distilling the very best of their previous work into a lithe, muscular 32 minutes of indie pop bliss. And with yet another album's worth of material already being polished for the studio, the band have set the stage for an intriguing second act.